At its highly anticipated launch event in London, Nokia has given us our first look at the new Lumia 925, it’s latest Windows Phone 8 device ready to take on the might of this year’s top-of-the-range Android smartphones. Nokia CEO Stephen Elop wasn’t present, leaving Jo Harlow, VP of Smart Devices, and Stefan Pannenbecker, the VP of Design at Nokia to take the stage. The Lumia 925’s big feature is its camera. While it has the same pixel count, 8.7-megapixels, as the Lumia 920, the lens has a new, advanced design. Sadly though, unlike the Lumia 928, the Lumia 925 doesn’t have a xenon flash, and sticks with a dual-LED flash instead. The optical image stabilization and 1080p video recording with OiS remains the same as the 920. Much of the short press conference concentrated on the Smart Camera app, which will come pre-installed on the Lumia 925. Ideal for action photography, it captures ten images in quick succession, and as well as letting you select the best one, also lets you play around with the results. It was demonstrated on stage by Jo Harlow, who switched her business attire for a basketball kit (yes, really) and was photographed dunking a basketball into a net. Using Smart Camera, the best shot could be selected and edited, including adding in effects such as motion blur. Although Smart Camera will start as a Lumia 925 exclusive, in the near future it’ll find its way onto other Lumia camera phones as part of a new update, named Nokia Lumia Amber. Leaving aside the camera, the Lumia 925 has a 4.5-inch touchscreen with a 1280 x 720 pixel resolution, and is an AMOLED display covered in a curved Gorilla Glass 2 panel. Inside the phone is a 1.5GHz, dual-core Snapdragon S4 processor with 1GB of RAM, plus 16GB of internal storage space. Wireless charging has been removed from the device itself, and like some of the more basic Lumia phones, the Lumia 925 needs to be fitted with a case to enable it. This, along with the aluminum band, means the phone now measures a sleek 8.5mm thick and weighs 139 grams. The feature list is completed with 4G LTE connectivity, NFC, and a 1.2-megapixel video call camera. Nokia will start to release the Lumia 925 in June, when it will sell for 469 euros in Europe, which by today’s exchange rates makes it $615, or about £400. In the U.S. T-Mobile will be the exclusive carrier, while in the UK it’s Vodafone, where a 32GB version will be on sale. Exact prices will be confirmed soon, but according to a tweet from UK network O2, the Lumia 925 will go on sale with them on June 13. Updated on 05/14/2013 at 11:10am by Andy: Three major UK networks have confirmed they will be selling the Lumia 925. Vodafone will be exclusively stocking the 32GB version, and has said the phone will operate on its 4G LTE network when it goes online later this year. 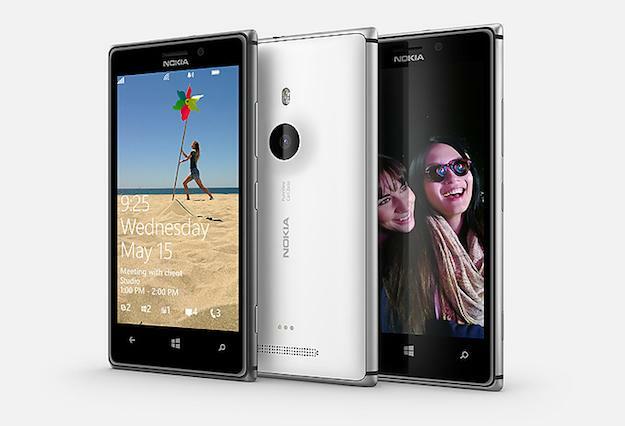 O2 has bagged the white Lumia 925, which it will release on June 13 with pre-orders beginning May 30. Finally, Three UK has added it to its Coming Soon page.